Comedian Tim Allen unleashes all the outrageous fun in this doggone hilarious update of Disney's comedy classic! The adventures begin when workaholic Dave Douglas (Allen) is accidentally transformed into a lovable dog. Now as Dave digs to uncover the mystery, this overworked dad wants nothing more than to stop fetching ... and get back to fathering. But before he does, he's about to discover that being man's best friend gives him a curious insight into what it takes to be a great dad! The tail-wagging fun continues with bonus features to howl about including bone-tickling bloopers, deleted scenes, and a special bark-along bone-us feature dogs will love! $16.310 million on 3501 screens. Given my love for canines, I’m unusually open to films that feature them prominently. This means I end up watching more than a few clunkers. Though it offers some minor pleasures, I’d have to toss the 2006 remake of The Shaggy Dog into that pile. At the film’s start, goons from pharmaceutical company Grant & Strictland go to Tibet where they abduct a mystical dog named Khyi Yag Po who barely ages. They want to discover the secret of his extraordinary longevity and market it as a drug. While they do this, a related trial occurs. Animal rights activist Justin Forrester (Joshua Leonard) allegedly broke into the firm and started a fire. Dave Douglas (Tim Allen) prosecutes the case and has his eye on the soon to be vacated district attorney position. This means the workaholic Dave rarely spends time with his family. His job also creates resentment in his 17-year-old daughter Carly (Zena Grey); Forrester is her teacher and she agrees with his animal rights views. After Dave makes her leave a protest outside Grant & Strictland, she takes her boyfriend Trey (Shawn Pyfrom) to find evidence of animal testing at the company. They come away with Khyi after he stages his own escape. Carly soon recognizes that Khyi’s presence doesn’t prove anything against Grant & Strictland, but she takes him home anyway. This is fine with everyone except dog-hating Dave. When he tries to get rid of Khyi – renamed Shaggy – the pooch bites him. This sends Shaggy’s unique genetic pattern into Dave and causes the attorney to slowly mutate into a shaggy dog. As one might expect, this causes many complications as Dave tries to restore his familial bond and also ascend to the DA job. If nothing else, I’ll give the 2006 Shaggy Dog credit for semi-originality. The movie doesn’t just rehash the story of the 1959 original, and despite its entry into the legal field, it doesn’t borrow much from 1976’s The Shaggy DA. It takes its own path, and I suppose that should count for something. To my surprise, Allen brings a lot to the role. I can’t recall any work of his I’ve ever liked other than his vocal performances as Buzz Lightyear in the Toy Story flicks, and I didn’t expect to care for him here. However, Allen gives it his all and milks the gags for all they’re worth. Shockingly, he actually delivers some humor. Shaggy doesn’t provoke many chuckles, but when it amuses, it does so due to Allen’s investment in the role. The early scenes in which he behaves like a dog are the best, as the film’s more subtle bits are moderately entertaining. In another surprise, Robert Downey Jr.’s take as the evil scientist Kozak provokes occasional mirth. As we learn in the commentary, he improvised quite a few of his lines, and ala Allen, he really throws himself into his part. Downey knows he’s slumming but he doesn’t care as he relentlessly chews the scenery. His cartoony approach works for his cartoon character and adds some humor to the project. Unfortunately, too much of Shaggy focuses on cheap physical gags. We get the usual body function related humor that I expected from this kind of flick. None of these amuse, as they simply seem lame and predictable. The movie loses a ton of steam when Dave totally turns into a dog. Allen’s voiceover work doesn’t give him much in the way of quality material, and the lame gags fail to evoke amusement. The flick fares best with Allen totally on screen and not just his voice. The story sure doesn’t provoke much interest. While the whole emphasis on the shenanigans at Grant & Strictland creates all sorts of machinations, none of them add up to much. All of it comes across as a platform for the cheesy physical gags, so don’t expect to find anything interesting or stimulating in the story. 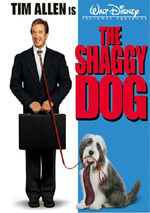 I must admit The Shaggy Dog entertained me more than I thought it would, solely due to some fun work from Tim Allen. Unfortunately, he can’t do enough to make this into a good movie. It falls into many predictable plots and traps as it fails to turn into something generally enjoyable. 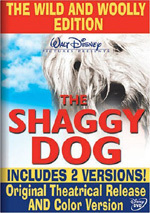 The Shaggy Dog appears in both an aspect ratio of approximately 2.40:1 and in a fullscreen version on this single-sided, double-layered DVD; the widescreen image has been enhanced for 16X9 televisions. Only the letterboxed picture was reviewed for this article. While no serious concerns appeared, the transfer was rather lackluster at times. Sharpness was decent but erratic. I found moderately soft wide shots at times. Though most of the movie offered pretty good clarity and delineation, I saw enough fuzziness to create distractions. No issues with jagged edges or shimmering occurred, and I noticed no source defects from this clean image. The film went with a natural palette. The hues looked accurate and concise, as the colors consistently appeared clean and distinct. Blacks were adequate but shadows tended to be a bit drab. Some dark elements mushed into the background and didn’t stand out well. The transfer was decent but not much better than that. The Dolby Digital 5.1 audio of The Shaggy Dog fared better. The setting didn’t boast a lot of active scenarios, but the soundfield depicted the environments well. Some of the livelier scenes like the abduction of the dog or the infusion of the pooch’s DNA into Dave used the soundscape to good effect. Most of the time it went with general ambience, and those elements opened up the flick. This wasn’t a stellar mix, but it satisfied. Audio quality was strong. Speech always remained natural and concise, and the score showed solid range and clarity. Effects also came across as clean and accurate. They displayed punch when necessary and always seemed well represented. This was a perfectly satisfactory mix. A few extras fill out the package. First comes an audio commentary with director Brian Robbins and producer David Hoberman. Both sit together for this running, screen-specific chat. They create a perfectly adequate discussion but don’t go much beyond that. During the commentary, the pair get into the reworking of the remake and story development, plot and character issues, cast and performances, sets and locations, and editing. They also relate notes about working with the animals – particularly dogs, of course – as well as all the effects techniques used to bring the situations to life. Robbins and Hoberman remain consistently chatty and usually are engaging, though they throw out a lot of the requisite praise for all involved. We get a pretty good picture of the production and its challenges; I just don’t think it ever turns into anything more dynamic and involving than that, though. This is a decent to good chat. Four Deleted Scenes fill a total of four minutes, 18 seconds. We find “Kozak and Strictland” (1:40), “Additional Dog Park” (1:13), “Gwen and Larry” (0:28) and “Alternate Ending for Kozak” (0:56). The first two offer unnecessary exposition, while the third is simply a tag for those characters. The “Alternate Ending” isn’t very different, though it’s freakier. None of the deleted scenes bring much to the table. A collection of Bloopers goes for two minutes, 35 seconds. Most of it focuses on Tim Allen’s clowning and the antics of the movie’s many animals. Those factors make the set a little more amusing than most, but not a lot. Finally, Bark-Along offers a “Bonus Feature for Your Dog to Enjoy”. The “Bark-Along” version shows shots of the movie’s dogs with barking over the footage. The “Sing-Along for Humans” version gives us the same shots with “Woof! There It Is” on top of it. Both are pretty darned useless. The 2006 version of The Shaggy Dog could have been worse, as a pretty good lead performance from Tim Allen partially redeems it. However, too many negatives occur to elevate the film above the level of generally weak. The DVD offers adequate picture and audio as well as minor extras highlighted by a decent audio commentary. This one might entertain the kiddies, but others will likely want to skip it.